How to Crate Train a Dog Like a Pro – ComeHereBoy! 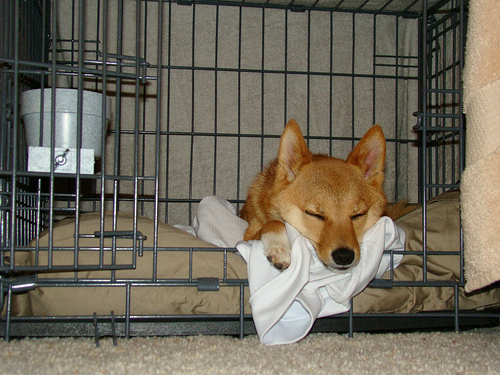 Crate training is unarguably one of the best things you can teach your dog. When you crate train, you are helping create a safe space for your dog to be in. A space that is his and his only (yeah, this means you gotta keep the kids out of it.) Crate training can keep you sane when you have a dog that you’re frustrated with. Crate training is great for when you have a dog that is destructive when you leave the house, a dog that gets overstimulated, a puppy that eats your shoes, a dog that jumps or pees when someone comes in the door (you can teach them to go to their crate on cue when there is a door knock or bell.) Really nearly any dog out there can benefit from it. When you crate train a puppy, it is far easier to potty train and to help limit your puppies chewing tendencies. Also, crate training is important for if you ever need to board your dog, take him in the car anywhere, take him to the groomers or leave him at the vet. The people who have to take care of your dog will thank you for your diligence in training. And I know that anyone who comes to visit your house that is afraid of dogs will feel much better if your dog is resting quietly in a crate instead of howling and scratching and barking. So how to crate train a dog? We’ve gathered several videos and articles from esteemed positive dog trainers to help you make your dog comfortable in a crate. Ian Dunbar is a very well known and respected positive dog trainer. This short video by him shows some basic ways to get your dog to like the crate and to enter it on cue with treats. Victoria is the trainer on “It’s Me or the Dog” on Animal Planet. Her methods are very positively oriented and her article very thoroughly goes over the different methods of crate training a puppy or a dog. She also talks about how to limit crate use and addresses questions about dogs eliminating in the crate or barking and whining. Included in her article is a little video to illustrate the methods she uses. John Silverman, star of Good Dog U, explains thoroughly why we crate train and talks about making sure the dog thinks of the crate completely positively. He is more explicit on schedule and timing on helping the dog gradually get used to the crate over time. As you can see in the articles and videos, crate training your dog is a really important step to take to help your life with your dog be more harmonious. Do you have any other tips on how to crate train a dog, based on experience?